The century of conflict that would introduce the concept of total war to the world had its bloody roots on an obscure hilltop in the remote South African veldt. 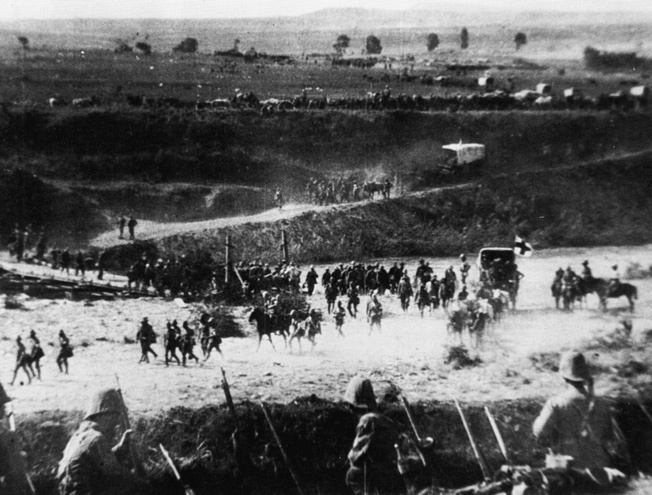 The Boer War, the last imperial struggle of the British Empire, would serve as the dividing line between the era of small, localized wars fought largely at the speed of hoof and foot and the global, mechanized slaughter that would follow. It would also prefigure the dismaying pattern of conflicts to come—the use of barbed wire, the introduction of concentration camps to contain Boer prisoners and their families, and industrial-age innovations in human-killing weapons. “War, which was once cruel and glorious, has become cruel and sordid,” globetrotting adventurer Winston Churchill would complain after observing the short, sharp conflict between his nation and the Republic of South Africa. It was—literally and figuratively—the beginning of the 20th century. The war had a golden pedigree. When the precious metal was discovered in enormous quantities in the Transvaal region of South Africa in the 1880s, it roiled an already troubled situation. The Boers, itinerant Dutch-descended farmers, already had voted with their feet 60 years earlier in the “Great Trek” northward away from the growing British presence in the south. Now they were growing increasingly restive. Fiercely independent, they wanted no part of British intrusion into their public and private affairs, particularly the accompanying moral lectures on the burghers’ need for kinder, gentler relations with their slaves and servants. 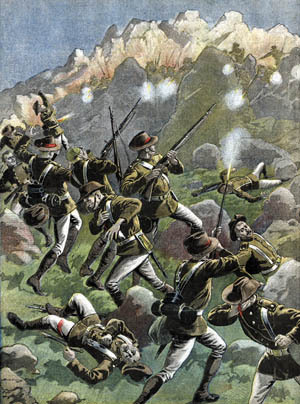 In 1881, Boer militia had ended the first armed conflict with Great Britain by hacking to pieces a British force at Majuba Hill. Humiliated, the British government acceded to self-government in the Boer republics of Transvaal and the Orange Free State. (The South African colonies of Natal and Cape Colony continued to fly the Union Jack.) Two decades of uneasy peace followed. The ensuing gold rush into the Witwatersrand upset the delicate political balance, bringing an unwanted influx of English prospectors into the heart of the Transvaal. These “Uitlanders,” as they were called, were close to forming a majority in the region. During an era when the world’s economy ran on gold, Great Britain saw in the large expatriate presence a heaven-sent opportunity for expanding its influence in its former territories. The Boers were well aware of the demographic danger. A clear indication of that danger came in the notorious Jameson Raid of 1895. Instigated by Cape Colony Prime Minister Cecil Rhodes—creator of the DeBeers diamond fortune—the raid began when Rhodes protégé Starr Z. Jameson led a force of Cape Colony volunteers into the Transvaal to coordinate an attack with restive Uitlanders in the boomtown of Johannesburg. The plan went disastrously awry when the rebellion did not spread as expected—opposition to Boer rule had been overestimated. Jameson and his men were quickly rounded up and handed over to British authorities, who gave them a mere slap on the wrist, further outraging Boer sensibilities. General Sir Redvers Buller was the commander-in-chief of British forces in South Africa. Weapons and ammunition poured into the Boer republic from the Netherlands and Germany, which was eager to see Britain humbled again by the Boers. Old Martini-Henry rifles were replaced with modern German-made Mausers, and “God and the Mauser” quickly became the Boer war cry. Meanwhile, Transvaal President Paul Kruger roughly suppressed the Uitlanders, refusing them the right to vote and resisting intense British diplomatic pressure. Diplomatic entreaties might be ignored, but as Kruger and his countrymen gazed across the border, they saw something they could not control: shiploads of British Army reinforcements steadily disembarking in Cape Colony and Natal. The Boers must act or face a swelling tide of British soldiers. Kruger issued an ultimatum: Unless the British buildup ceased and its forces withdrew from the frontier, the Transvaal would fight. On October 11, 1899, the ultimatum expired, and war for control of the fabulously wealthy region began. The words Kruger had spoken to his countrymen after the discovery of Transvaal gold—“Instead of rejoicing you would do better to weep, for this gold will cause our country to be soaked in blood”—were now sadly prophetic. The Natal-based garrison at Ladysmith, where colonial governor Sir George White was in residence, was one of the keys to the British defense; Kimberly and Mafeking were the others. The three cities ringed the perimeter of the Boer republics. The Boers understood this and took immediate steps to forestall any offensive moves by the British. Kimberly and Mafeking were surrounded. (In the latter township, Lord Baden Powell would organize the boys of the town into the first troops of Boy Scouts.) In the British cantonment at Ladysmith, White and 12,000 troops were under imminent threat of capture. A British general of great renown, Sir William Penn Symons, already had been killed by a Boer sniper; his infantry brigade, reeling back from the extreme north of Natal, was now retreating toward Ladysmith. Feeling that destiny was on their side, the Boer inhabitants of the two British colonies were now rising in rebellion, turning the preexisting political demographic on its head. For the British, the news everywhere was grim. Winston Churchill, who sailed over to Cape Town from England with General Sir Redvers Buller, the commander-in-chief of British forces in South Africa, reported back caustically that the British could “for the moment, be sure of nothing beyond the gunshot of the Navy.” It was far from clear that Buller was the right man for the job. Although he had four decades of military experience behind him, as well as a Victoria Cross, Buller was unused to fighting any enemy with a level of sophistication higher than that of the Zulus. Engaging him now was a highly motivated mounted force both nimble and armed with modern weapons. In a moment of candid self-appraisal before the war, Buller had said, “I have always considered that I was better as second in command in a complex military affair that as an officer in chief command.” This was the man who now faced the daunting military task, defending the two British colonies in South Africa from a determined and resourceful enemy equally at home on the veldt or in the mountains. Winston Churchill in South Africa. 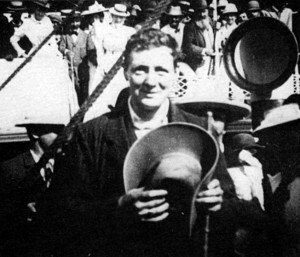 While Buller remained at Cape Town to sort things out, an impatient Churchill teamed with journalistic colleague John B. Atkins of the Manchester Guardian to go to the front at Ladysmith before other journalists could do so. The two took a 700-mile train ride on an undefended rail line that brushed against Boer strongpoints along the way. They then boarded a small steamer bound for Durban and immediately sailed into the teeth of an Indian Ocean storm. After several harrowing and wretchedly seasick days, the pair arrived at Durban to learn that Ladysmith was completely surrounded by Boers. Still determined to get to the fighting, Churchill and Atkins made another dangerous train ride of 60 miles that brought them to the end of the line at Estcourt. From there, they could hear the cannonfire at Ladysmith reverberating in the distance against tin-roofed shacks. Churchill personally directed the recoupling of the cars in an attempt to ram the blockade, and when that failed, he led a group of wounded soldiers to relative safety beyond a nearby trestle. He was returning to lead more away from danger when he met some figures clad in slouched hats—Boers, he realized—leveling their rifles at him from a hundred yards away. He turned and ran in the other direction, bullets striking all around him. Minutes later a horseman appeared and pointed his rifle at the Englishman, who automatically reached for his pistol, only to find that he had left it on the train. He was taken prisoner after managing at the last second to discard two magazines of prohibited dum-dum bullets. With that, England’s preeminent warrior-journalist was led away to prison, his slyly discarded magazines very likely saving him from drumhead execution. While Churchill languished in Boer custody, depressing news filled the grim dispatches from South Africa to England. In the space of one week—December 10-15—the British suffered consecutive defeats at Stormberg, Magersfontein, and Colenso. From Buckingham Palace, a vexed Queen Victoria announced, “We are not interested in the possibilities of defeat; they do not exist.” But bold pronouncements could not obscure the truth arriving from the outer reaches of the Empire. The British had suffered their worst losses since the Crimean War a half-century earlier. All too clearly, the innate conservatism of the British military establishment had begun to take its toll. The cavalry had hitherto despised the carbine in favor of the sword—this in the dawning age of magazine-fed rifles and quick-firing guns. Few senior British officers realized that the old ways of open-order drill and carrying the day with regimental discipline and esprit de corps alone were now a prescription for outright slaughter. At Stormberg, an attempt to wrest control of a railway junction from the Boers miscarried when the British forces were purposely misled by a native guide during a night march. Seven hundred British soldiers were missing or captured. Magersfontein was even worse. The much-vaunted Highland Brigade made an assault across an open plain in virtual parade formation against an enemy whose positions were hidden behind undiscovered barbed wire. The Boers had devised a new battlefield tactic: digging trenches dug down the front of a hill, known as the military crest, rather than at the top. By the time the attempt at Magersfontein to relieve the garrison at Kimberley was called off, 900 dead and wounded members of the Black Watch littered the battlefield. Lt. Gen. Charles Warren wanted to bombard Boer positions on Tabanyama Ridge before launching his main assault. He was overruled by General Sir Redvers Buller who was stationed several miles to the rear. At Colenso, Buller’s attempt to relieve Ladysmith also failed. 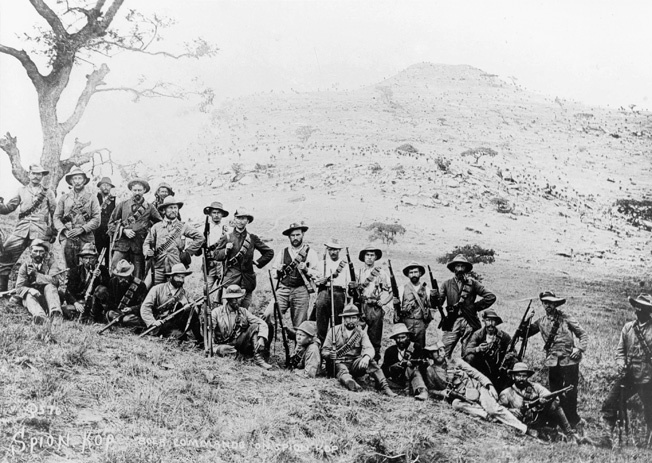 The Irish Brigade, which was to have crossed the Tugela (“Terrible”) River three miles away, was misled by another guide, this time into a bend of the river where they were enfiladed from all sides by Boer riflemen. To make matters worse, Buller had deployed 12 field guns at Colenso without an infantry screen. In the face of withering rifle fire, the guns had to be abandoned. A handful of heroic British volunteers tried to recover them, but only two guns were brought back successfully. Casualties were relatively light, in comparison to the earlier two battles—only 150 killed. Meanwhile, Ladysmith remained under siege, and the hard-pressed British troops encircled there had begun to eat their horses and mules. Until “Black Week,” as the English newspapers dubbed the six terrible days in mid-December, the worst of Britain’s casualties in the region had been suffered at Majuba nearly 20 years earlier, when fewer than 100 of her soldiers were killed. Now they were dying by the hundreds in battle after futile battle. These were not the usual native combatants on the fringes of the Empire—the Zulus, Pathans, or Dervishes. The Boers knew the ground far better than their foe, and they also knew the value of entrenching themselves within it. “Dig now, or they’ll dig your grave later” was their watchword. They were fiercely determined and well armed. A heavy Maxim gun firing one-inch shells, dubbed the “Pom-pom,” ranked alongside German-built Krupp howitzers, 75mm field guns, 155mm “Long Toms” firing 40-pound shrapnel shells, and the ubiquitous Mausers, effectively shredding the serried British ranks. Slowly, it dawned on the British that this was to be no “splendid little war” such as the United States had enjoyed against Spain the year before, but a grinding fight to the death against a seriously underestimated enemy. Buller was badly shaken, wiring home the despairing judgment that “I ought to let Ladysmith go.” He then sent a message to the encircled White, ordering him to burn his ciphers, fire off his ammunition, and seek whatever terms he could with the enemy “after giving me time to fortify myself.” What happened instead was a change in leadership. Buller was demoted, although he continued to command the forces in Natal, and he was told to persist in trying to lift the siege at Ladysmith. The new British commander-in-chief was retired Field Marshal Lord Frederick Roberts, 67 years old when he was recalled to active duty. 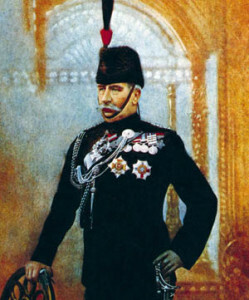 Lord Horatio Herbert Kitchener—“Kitchener of Khartoum”—would serve as Roberts’ chief of staff. Roberts had already had at least one communication from Buller before he departed from London for his South African command: “Your gallant son died today. Condolences, Buller.” Such was the epistolary epitaph of the younger Roberts, who had been killed trying to save Buller’s guns at Colenso. While Roberts and Kitchener were taking charge of the overall situation, Buller was reinforced in Natal by Lt. Gen. Charles Warren and the 5th Infantry Division. Warren was an odd choice to aid Buller—the older general despised him from Warren’s days as a commander in Malaya, when he had bombarded Buller with demands and complaints while Buller was serving as British adjutant general. (“For heaven’s sake, leave us alone,” Buller had finally told Warren, in utter exasperation.) Now he gave Warren the task of crossing the Tugela River and moving on the Boer right at Tabanyama Ridge, 12 miles southwest of Ladysmith. 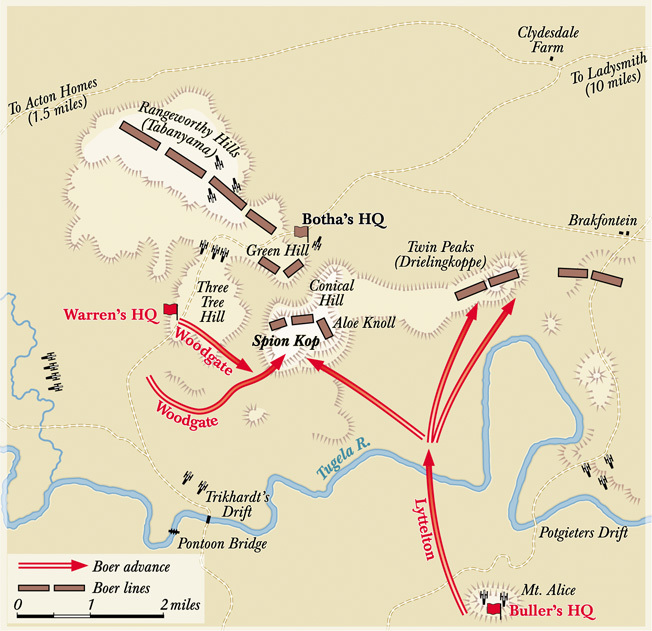 Meanwhile, Buller would attack the enemy center at Potgeiter’s Drift. Once through the hills beyond the river, the two English columns would reunite for a last-ditch drive across the open plains to Ladysmith. Warren, who had spent much of his career excavating historical sites in Palestine, had grown accustomed to the painstaking pace of archaeology. Given two-thirds of Buller’s ponderous army to command—11,000 infantrymen, 2,200 cavalry, and 36 field guns—he took the better part of nine days to reach Trichardt’s Drift on the Tugela, the jumping-off point for the coordinated attack. Another day was wasted ferrying guns and supplies across the river. A Boer commando unit poses for a photo in front of Spion Kop. Aside from being skilled fighters, they also had intimate knowledge of South African terrain. The Boers, with their crack contingent of scouts, knew every move the British were making. They responded by strengthening their defenses and shifting troops from the siege of Ladysmith to the line of hills overlooking the Tugela. Louis Botha was dispatched to take command of the burghers’ defense. Reasoning correctly that the British always attacked head-on, Botha paid particular attention to the large hill in the center of his line—Spion Kop. Aptly named, the boulder-bedecked “Spy Hill” rose to a height of over 1,400 feet, the centerpiece of several hills that commanded the veldt and the approaches to Ladysmith north of the river. Sixty years earlier, the first hardy voortrekkers had climbed its prominence during the Great Trek northward. Then, as now, they were fleeing the British, but this time they were better armed and better fortified. When the time came, they would be ready. On January 20, Warren finally attacked the Boer positions on Tabanyama Ridge. The khaki-clad British troops managed to carry a hill or two before halting amid a cyclone of Mauser fire. Ahead of them lay a thousand yards of open grassland, more than enough distance to give them pause, particularly in the face of the quick-firing Boers. Warren wanted to conduct a leisurely bombardment before making another attack, but he was overruled by Buller, who ordered him to attack again immediately. The order came with an explicit “or else.” Buller threatened to call off the entire campaign if Warren did not do as he was told. Thinking quickly—or at least as quickly as he was capable of thinking—Warren suggested an alternative plan. Instead of renewing his attack on the Boer right, he would move on Spion Kop. Buller was not appeased. “Of course you must take Spion Kop,” he told his hated subordinate, but he neglected to supply him with any new troops or ideas on how to accomplish it. It was going to be left to Warren alone, much to the detriment of the men he commanded. After taking Spion Kop, British forces made the ghastly discovery that they were sitting ducks for the Boer sharpshooters above them. The hill had been shrouded in fog, and when the mists slowly cleared with the dawn it became all too evident to the British that they did not hold the hilltop at all, but only a small, acre-wide plateau ringed on three sides by higher hills that afforded the enemy perfectly sited, boulder-protected firing positions. The Boers, who had watched the leisurely progress of the British with tight-lipped satisfaction, were even now creeping into those positions. Botha ordered his men to retake the position before the British had time to move up their own heavy guns. His burghers quickly poured devastating salvos into the densely packed British troops. The Englishmen, hunkering down in shallow trenches in a confined space comparable in size and dimension to Trafalgar Square, had little cover. The Boers’ artillery, signaled by heliograph, directed intense fire at Spion Kop from the surrounding hills. Shells rained down on the British position at the rate of 10 per minute. Meanwhile, the British heliograph had been knocked out, and they had no comparable artillery support from their own crack gunners. The soldiers atop Spion Kop were on their own. Responding to Botha’s call for reinforcements, Commandant Henrik Prinsloo led his 88-man Carolina Commando onto Aloe Knoll, 400 yards east of the British position. From there, Prinsloo’s marksmen unleashed a deadly fire on the unsuspecting men of the Lancashire Fusiliers, who were on the extreme right flank of the British trench. The Khakis, as the Boers called them, never knew what hit them. Seventy were later found lying dead with bullet holes in the right side of their heads—they had not even had time to turn around. Also struck dead was their commanding general, Woodgate, who fell mortally wounded with a shell splinter above his right eye. His replacement, Colonel Malby Crofton, sent a hasty message down the hill to Warren: “Reinforce at once or all lost. General dead.” Warren, unhelpful as always, signaled back: “You must hold on to the last. No surrender.” His entire career depended on it. Grimly, the British held on to the 400-yard-wide battlefield. No one on the British side had given much thought to what to do after seizing Spion Kop; asked what his force should do next, Buller had answered dogmatically, “It has got to stay there.” It stayed there all right, stolid and immobile, absorbing a horrific beating. Many of the officers were killed, victims of the Victorian-era code that prohibited a gentleman from taking cover under fire. The men in the ranks, less hidebound and conventional, squirmed into every square inch of cover they could find in the rocky topsoil. It did little good. Boer artillery shells dismembered entire files of soldiers where they lay, while those foolish enough to raise their heads off the ground were immediately shot dead by enemy snipers. 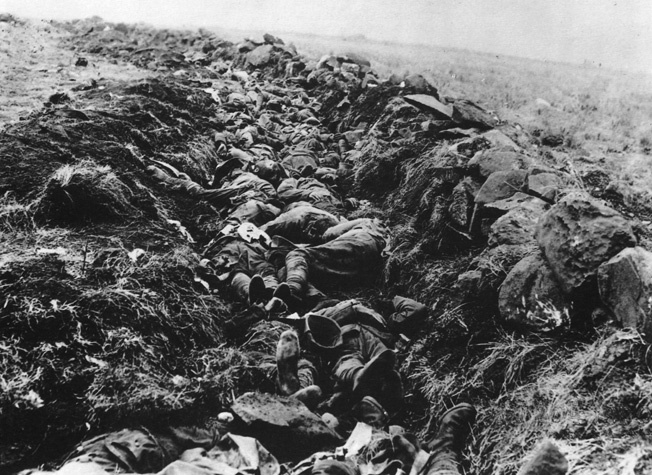 On the morning after the bloody fighting at Spion Kop, a large trench serves as a makeshift grave for some 400 dead soldiers who perished there. On the command level, all was chaos. At one time or another, four separate senior British officers believed themselves to be in command. In his only direct action of the day, Buller recommended to Warren that he “put some really good hard fighting man in command on the top. I suggest Thorneycroft.” Warren, glad for any assistance, promoted Throneycroft to brigadier general and gave him operational control of the battle. Thorneycroft’s first move was to countermand an attempt by the Lancashire Fusiliers to surrender to the Boers who were bedeviling them. “Take your men back to hell, sir!” Thorneycroft roared at the Boer officer who had approached to accept the surrender under a white flag. “I allow no surrender.” Shamefaced, some of the Fusiliers skulked back to their own lines; others, having no wish to commit state-sanctioned suicide, dashed into the Boer lines and surrendered. After a hurried conference with Crofton and Lt. Col. Ernest Cooke of the newly arrived Scottish Rifles, Thorneycroft ordered a total withdrawal. A last-second message from Warren promising that help was on the way fell on deaf ears. “Better six good battalions safely down the hill than a bloody mop-up in the morning,” Thorneycroft said. “I’ve done all I can, and I’m not going back.” In vain, the upstart Lieutenant Churchill argued the point, and the retreat began. Abandoning the hard-won hill, the British survivors met their reinforcements massing at the bottom, en route to assist them in consolidating their position. It was too late—surely the Boers had already retaken the hilltop—and Thorneycroft turned these troops around as well. Survivors and reinforcements alike trudged back down the hillside. Finally, with his artillery in full support, Buller managed to throw a pontoon bridge across the Tugela, and overwhelming British infantry turned the key in the Ladysmith lock, seizing the last remaining hilltop barring their way. The siege of the British forces there had lasted 118 days. It was lifted on February 27, 1900, ironically the anniversary of the defeat the British had suffered at Majuba 19 years earlier. Lord Roberts now took center stage as overall commander after the protracted drama of Ladysmith. His forces totaled over 200,000 against 88,000 Boers. The latter began to abandon the Transvaal, retreating into the hinterland in another Great Trek. Churchill, as ever marching to the sound of the guns, carried by bicycle a crucial dispatch to Roberts through a Johannesburg still occupied by Boers; the slightest challenge by a wary burgher might have caused him to be executed as a spy. His audacity endeared him to yet another commander-in-chief. As the Boers withdrew to the east, yielding large parts of the Transvaal, Roberts allowed Churchill to enter Pretoria at the front of the column. One of Churchill’s singular pleasures was to hoist the Union Jack over the place where he had been held as a prisoner of war. In a still taken from a newsreel of the fighting at Spion Kop, Buller’s shellshocked columns retreat over the Tugela River via pontoon bridge after losing the Battle of Spion Kop. The laborious and cumbersome movements doomed hundreds of regular British soldiers to a Mauser bullet in the head at Spion Kop, and the hidebound conventions of the Victorian era—sneering at the use of cover and demanding an unflappable hauteur in the presence of the enemy—left their bloody epitaph stitched across the chests of their gentlemanly commanders. Few British survivors of Spion Kop would have disputed the mordant words of Manchester Guardian correspondent John Atkins, who was there that day and later summed up the battle as “that acre of massacre, that complete shambles.” Indeed it was.